How much is grown and produced in Alaska? According to 2017 USDA/NASS data, there are approximately 990 farm operations in Alaska and more than 849,000 acres operated for farming. It is estimated that 98% of Alaska's food is imported, although if consumers demanded more Alaska Grown products, more could be produced and processed in-state. For more Alaska-specific data from our USDA/NASS statistician, see the 2017 Alaska Census Briefing. When is produce available in Alaska? 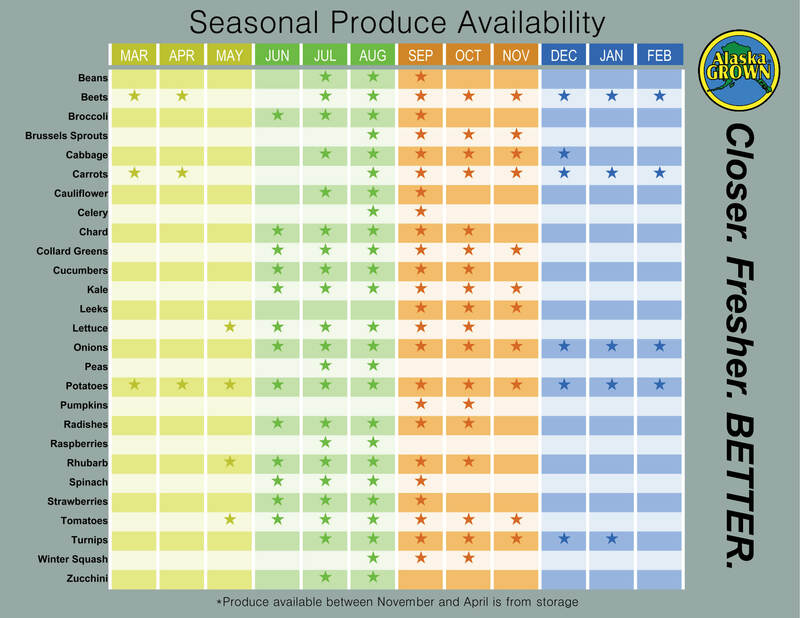 The prime time for produce in Alaska is June through November, however, some produce like potatoes, are available almost all year long. Where can I get Alaska Grown meat? Many local butcher shops and locally owned retailers source Alaska Grown meat to include beef, pork, bison and elk. You can call the stores in your area to see what is available. Am I allowed to use the Alaska Grown logo? In order to use the Alaska Grown logo, you must become an Alaska Grown member. For additional information please click on the 'Join' tab on this webpage. Do You Grow Specialty Crops? Are there Grants available for growing or producing Agriculture? There are a variety of grants provided for agricultural related projects throughout the state. For a list of grant opportunities through the Alaska Division of Agriculture, click here. Learn about Specialty Crop Grant Projects that include agricultural research and education throughout the State of Alaska.